Since American base ball’s beginnings, clubhouses have been prevalent among even the earliest base ball clubs. 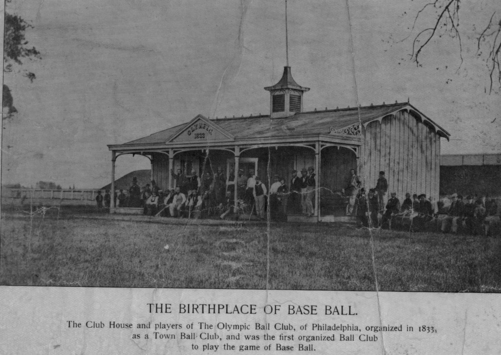 The Olympics of Philadelphia , which began playing town ball in the 1830’s and switched to base ball in 1860 had one of the earliest clubhouses known in base ball. According to author Peter Morris, in the book But Didn’t We Have Fun?, clubhouses were a powerful symbol of the pride felt by early clubs and were decorated with flags, pictures, trophies, gilded game balls and other memento’s of the club’s triumphs. Perhaps the greatest Clubhouse of the early days was the Eckford Club of Brooklyn’s Clubhouse. 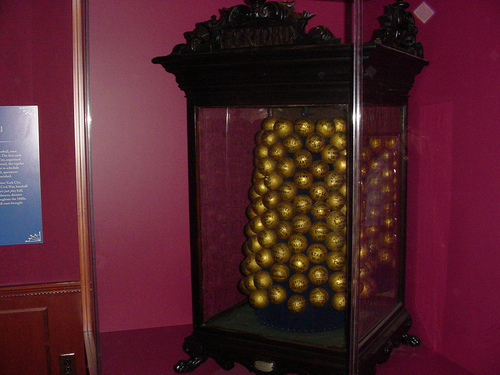 It featured a trophy case with 168 base balls that the club had won in match play between 1854 and 1868. The Clubhouse was so popular, that it continued to operate and draw patrons twenty years after the team had folded! The trophy case now rests in the Baseball Hall of Fame in Cooperstown. The original Cleveland Blues had something of a clubhouse. They conducted many of their club meetings, and entertained guests at the Weddell House and Hotel (Superior and W. 6th). 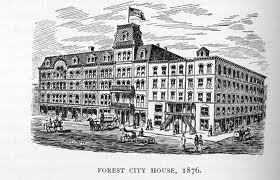 This building is also significant because it housed visiting clubs from the old Forest City and Union Railway days. Club members also worked out in the hotel during the winter months. The current version of the Blues opened it’s own Clubhouse in March, 2011. It was built entirely by members of the club, who volunteered many hours to complete the project. Materials for the clubhouse were donated by almost all of the members of the club, and a generous monetary donation from Black-Berri-Wine-Row kranks Barbara and Denis Demagall, Ken "Hammer Schutz, Neil "Bristles" Dobrovic, Nancy Inch and Tom "Meal Ticket" Inch. Pat “Furbelly” McGinty and John “Pubs” Granzier donated many “bar-type” items as well as the space for the Clubhouse. The current Clubhouse is decorated as a clubhouse from the 1860’s would have been with a few modern ameities (electricity). There is no running water, and only a few electric lights. A small bar showcasing calamity waters and an old ice box keep the barley pops cool for our visiting guests. The walls are adorned with pictures of Cleveland’s first base ball clubs, pennants, trophies and other base ball related memorabilia. The Clubhouse also showcases our Trophy Ball Display Case, patterned after the Eckford of Brooklyn Club. 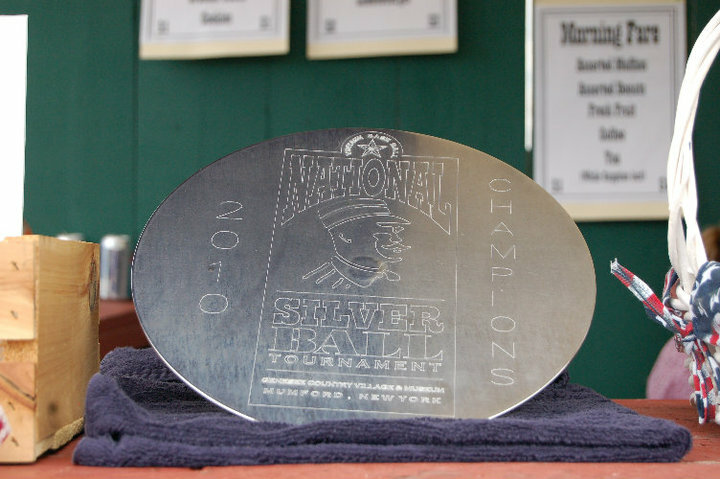 We also have our 2010 National Silver Ball Champion Trophy on display. The area is furnished with tables and chairs, as well as some old furniture from the time period. During the off-season, many of the Blues’ tradition items will also be on display, such as our club banner, lucky broom, and lucky horseshoe. Old bats, balls, and other Cleveland related base ball items will be on display, including some items on loan from the Baseball Heritage Museum and Bertman's Ball Park Mustard. We also have a rare Bertman’s Ballpark Mustard dispenser on hand in case people need some good mustard on their hot dogs. We hope you enjoy The Blues’ latest attempt to keep our great base ball heritage alive in the fine City of Cleveland.